If your son and his friends love to explore and create their own worlds in their favorite video game, use items from the Minecraft Party Supplies to make an amazing party for all of them! Get tableware items like dinner plates and napkins, decorations like table covers and balloon bouquets, and fun party favors like personalized stickers, favor cups, and checker bandannas! Bring a video game adventure of mining, crafting, and creatures to your child's birthday party with the Block Miner party theme! Bring the retro 8-bit style of old-school arcades and modern indie video games to life with our Block Miner birthday party theme! From tableware to decorations, there are more than enough pixels to go around, and a DIY party theme like this is every bit as customizable as an open-world sandbox adventure. By building with combinations of green, black, brown, and gold basic party supplies, you can craft a totally original look that still looks like your child’s favorite game. Minecraft party supplies and official Minecraft masks featuring the likenesses of Steve, Creepers, and Endermen are just a few of the dress up ideas that can be used to get guests into character, too. Keep on reading to discover more Block Miner party ideas below. It’s always helpful to have party supplies ordered in advance of your child’s big day. We recommend giving yourself about a month of wiggle room, so that there’s time to make any last-minute changes. BirthdayExpress.com’s huge collection of items makes it easy to stay ahead of schedule as well as under budget. Visit the Birthday Express Ideas blog to get more ideas on how to plan the perfect birthday for your child! See detailed styling tips and ideas for every aspect of the Block Miner theme, including party food ideas, decorating ideas, party game ideas, and more. Plenty of pixels make the perfect building blocks for building our Block Miner theme, and old-school 8-bit backdrops like this work wonders. 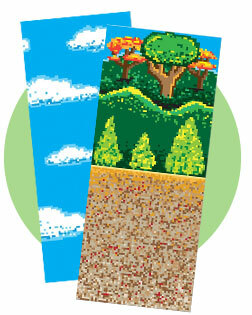 The retro video game style fits in perfectly with this party theme, and is just one of the many unique party decorations that can be found on BirthdayExpress.com. We wanted to create a style that suggests outdoorsy adventures for our Block Miner theme, so we’ve used different shades of grassy greens and other earthy tones to build up the look. Miners may even catch a glimpse of glittering gold along the way, too. With the color palette in mind, let your imagination run wild while blowing up bouquets of balloons, twisting twirls of crepe, fluffing up puffs of tissue paper, laying out layers of tablecovers, and preparing packages of party favors. Here are a couple ideas for special party decorations that will really take this theme to the next level. There’s nothing wrong with regular, solid color party balloons, but a singular simple printed design can definitely go a long way when decorating. A few bunches of these balloons, filled with helium and tied off with strands of blue ribbon, can create a lovely blue sky above a pile of presents or a table of refreshments. No adventurer is complete without his or her trusty horse (or donkey, or mule, or unicorn). This one might not exactly be like the real thing, but it certainly makes for a fine piece of scenery at the party. It’s also easy to stand up out of the box and can be kept after the party is over. 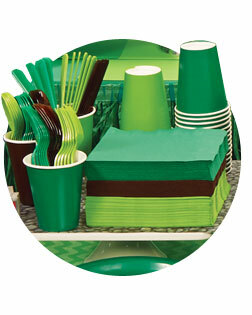 For this theme, we recommend a combination of green, brown, and black solid color party supplies, layered together to create a totally unique look. Every color of solid party supplies on BirthdayExpress.com can be found in its own Party in a Box package, which means that your entire color scheme can be crafted in just a couple of clicks. Build blocks of napkins and stacks of paper cups from differing shades, and table settings of plates and plasticware can be created so that no two are alike. Don’t forget about decorations: carry the same colors through to your selections of crepe paper, balloons, tablecovers, gift wrap, and ribbons. Our Block Miner birthday party theme is all about epic quests of exploration, so when the time arrives for activities, an afternoon of adventure is the name of the game. Here are a few party game ideas and other suggestions for party activities that we think will make this birthday party even more fun for everyone involved. Not only will they all fit the visual appearance of your child’s party to a tee, but they all help bring the adventure to life, too. Plus, each one has been selected just for this theme by our party experts, so a great time is guaranteed. Let party guests play their favorite characters from one of their favorite video games. Get official Minecraft masks that look just like the player character, Steve, as well as his enemies, the exploding Creeper and the spooky Enderman, on BirthdayExpress.com. All of these can also be used as great Minecraft party supplies, decorations, or centerpieces. 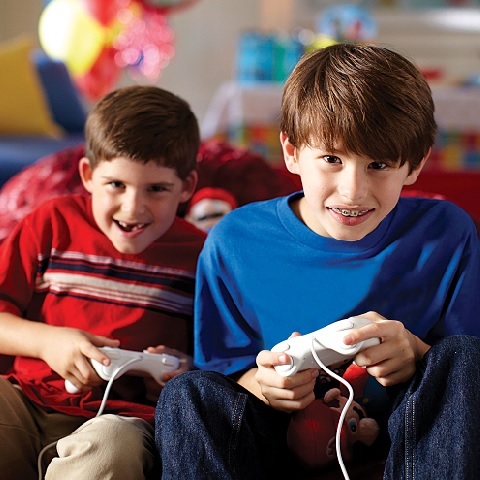 Creative and cooperative multiplayer video games are a great way for kids to use their imagination, too – and for a video game birthday party, what could be more perfect? Everyone can participate in the action, and you’ll also get a few minutes to either clean up after or set up for the next part of the party. Besides, think of it this way: there’s no way you won’t be the coolest parent around after this one. Just as an adventuring band of miners can expect to find glittering gold, diamonds, and even a few mobs of strange and spooky creatures while exploring a new area, party guests ought to discover a whole treasure trove of treats, too. Each of these party favor ideas has been handpicked to match the style of this party theme perfectly, and can be built upon to cater completely to your child’s favorites. With a stash of these fun party favors in hand, we guarantee that every party guest in attendance will be heading back to their home base after the party with a big smile. A few pairs of these pixelated shades will have every child looking super stylish – plus, if you’re planning on an outdoor birthday party, these party favors will come in handy for blocking the sun, too. The green and brown squares that cover these sunglasses make them fit in with the rest of the party theme wonderfully. These squishy and rubbery fake rocks are fun to play with, and safe to toss around. Use them as part of a party game and see which guest can land theirs closest to a target across the yard, place them on the table as part of the decorations, or just include them in your customized party favor packages.